The Federal Highway Administration’s new Accelerated Innovation Deployment Demonstration program provides $30 million in incentive funding to offset the risk of trying innovations. Unlike grants offered in past construction-focused programs, AID Demonstration incentives can be used for innovation in any aspect of highway transportation—from planning, financing, environment and design to construction, materials, pavements, structures and operations. They’re a possible resource for implementing technologies and practices in the Every Day Counts initiative, but they’re not limited to EDC innovations. A project can use any proven innovation the project owner doesn’t use routinely, but plans to adopt to improve its practices. “This program offers a new approach to demonstration projects,” said Ewa Flom, program manager for FHWA’s Center for Accelerating Innovation, which oversees AID Demonstration. "By leveraging resources and working together, we can accelerate innovation deployment as well as make innovation part of the transportation community culture." To get innovative solutions into practice faster, FHWA is accepting AID Demonstration applications through www.grants.gov on a rolling basis. State transportation agencies, federal land management agencies and tribal governments are eligible to apply for AID Demonstration funds. Metropolitan planning organizations and local governments can participate in the program, too, by applying for grants through state transportation agencies. AID Demonstration funds are part of the Technology and Innovation Deployment Program of the Moving Ahead for Progress in the 21st Century Act, so projects that win grants must address goals of accelerating innovation adoption, demonstrating state-of-the-art technologies, building longer-lasting highways and improving safety, mobility, reliability and environmental sustainability. Awards will be for the full cost of the innovation in a project, up to a maximum of $1 million. The innovative activity and project must be eligible for assistance under title 23 of the U.S. Code. The proposed innovation is truly innovative to the applicant. The applicant understands the purpose and benefit of the innovation in the project. The applicant is committed to monitoring, assessment and technology transfer. AID Demonstration fund recipients will develop performance goals for their projects and determine how to meet them. They’ll work with FHWA on a plan to collect information on project performance. Recipients will produce project reports that document the process, benefits and lessons learned, as well as any guidance, specifications or other tools they develop to support rapid adoption of innovations as standard practices. They may also participate in events such as workshops and site visits to share information on the innovations with other transportation professionals. AID Demonstration grants can be used to deploy Every Day Counts innovations. For more information on the AID Demonstration program, contact Ewa Flom at (202) 366-2169 or visit the Center for Accelerating Innovation’s Grants webpage. For project-specific questions, contact your state FHWA division or Federal Lands Highway office. To apply for a grant, go to Grants.gov. Readers of the Federal Highway Administration’s Focus newsletter, which published its last issue in April, will now receive Innovator. FHWA began publishing Focus in 1987 to report on innovations to improve the quality, safety and service of roads and bridges, from pavement preservation strategies and anti-icing techniques to asset management and work zone safety improvements. Launched in 2007, Innovator continues the Focus tradition of bringing readers the latest information on accelerating innovation use to build transportation infrastructure faster, better and smarter. May/June is the first all-electronic issue of Innovator, which features enhanced content, a new design and opportunities to provide feedback while saving on printing and mailing costs. Spanning nearly half a mile, the new Milton-Madison Bridge is the longest in North America to be moved into place using the accelerated bridge construction technique of a lateral bridge slide. Crews moved the bridge 55 feet from temporary piers to permanent, refurbished piers in April. They used steel cables and computer-controlled hydraulic jacks to slide the bridge into place. 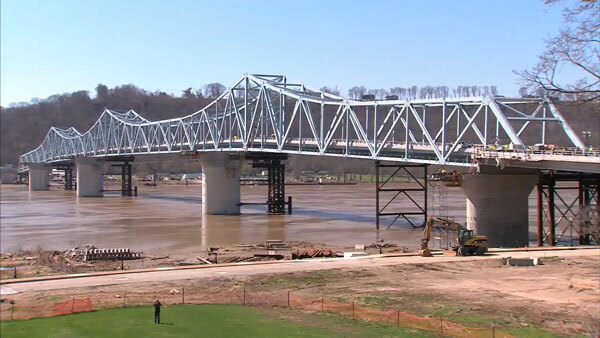 The project—a joint effort of the Indiana Department of Transportation and the Kentucky Transportation Cabinet—replaced a deteriorating bridge over the Ohio River connecting Milton, Kentucky, and Madison, Indiana. It was built using the design-build method, which saves time by overlapping the design and construction phases of the project. The Minnesota Department of Transportation has selected its first construction manager/general contractor for the Winona Bridge project over the Mississippi River. The project is expected to be delivered in three or more parts: the new bridge substructure, the new bridge superstructure and approaches, and the rehabilitation and reconstruction of the existing historic bridge. When substructure design is completed, the CM/GC contractor will negotiate with the Minnesota DOT on a contract to build the substructure. Meanwhile, the contractor will provide construction advisory services on the other parts of the project in final design and will have the option of negotiating with the agency on the remaining construction contracts. The FHWA Maine Division, Maine Department of Transportation, U.S. Fish and Wildlife Service, National Marine Fisheries Service and U.S. Army Corps of Engineers signed an updated programmatic agreement on Section 7 of the Endangered Species Act. The agreement will streamline the review of projects that have no effect on listed or proposed threatened and endangered species or designated critical habitat. It’s the first transportation programmatic agreement in Maine to include the Army Corps of Engineers as a signatory. The Louisiana State Police partnered with the Louisiana Department of Transportation and Development and the Louisiana Office of State Fire Marshal to announce the start of a state traffic incident management training initiative. Members of the state’s first traffic incident management train-the-trainer class, conducted by FHWA, attended the media event. More than 1,000 responders are expected to be trained over the next year to handle traffic incidents safely and quickly, including every state trooper in Louisiana. Innovative solutions can turn challenging highway projects into successful ones. That’s why more transportation agencies are turning to alternative technical concepts for innovative, cost-effective options that are equal to or better than their own project criteria. Through Every Day Counts, the Federal Highway Administration is encouraging highway agencies and other industry stakeholders to incorporate ATCs into their construction project toolkits. Allowing contractors to provide alternative solutions during a competitive procurement process offers potential for cutting project costs, reducing risks, increasing quality and accelerating schedules. Using ATCs also encourages innovation and flexibility, advances new technologies and construction methods, fosters early contractor involvement in projects and promotes solutions that increase the value of projects to the public. ATC use is common on design-build projects, which combine the design and construction phases in one contract. They’ve also been used on projects built with the traditional design-bid-build delivery method and the construction manager/general contractor technique, a two-phase process that allows agencies to include a contractor’s perspective in planning and design decisions. Basically, an ATC is a proposer’s request to modify a contract requirement—generally by offering an innovative construction option that can provide a competitive edge—during the bidding or proposal process. The highway agency issues an invitation for ATCs that describes the base project design and construction criteria. Contractors submit suggestions for ATCs that, if the agency approves them, can be incorporated into bids or proposals. The process allows contractors to offer innovative ideas confidentially. The agency determines which ATCs to accept. They can include, for example, concepts that accelerate project delivery, reduce construction impact on travelers or add features the agency and the public desire. Each contractor incorporates its approved ATCs into its proposal or bid. 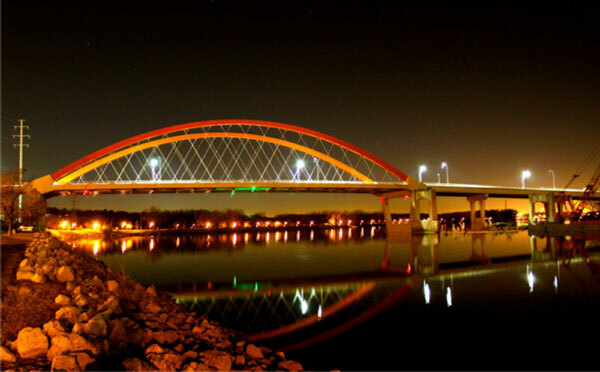 ATCs contributed to a 40 percent cost savings on the Hastings Bridge project in Minnesota. The Minnesota Department of Transportation combined design-build with ATCs to speed delivery while controlling costs on its project to replace the Hastings Bridge over the Mississippi River. The original estimate was $200 million, but the final contract award came in 40 percent lower at $120 million, thanks in part to ATCs. One was a 545-foot-long main span—the longest freestanding tied arch in North America. Using ATCs is saving the Florida Department of Transportation $30 million on an I-95 design-build project. The agency proposed a modified diamond interchange including a third-level interchange with two curved steel flyover ramps. Several firms offered cost-saving alternatives. The winning proposal suggested a Texas U-turn that eliminated the curved steel flyover ramp, saving millions and providing equal or better service compared to the original concept. Image Gallery: A Michigan project included ATCs to accelerate construction while safely maintaining traffic. 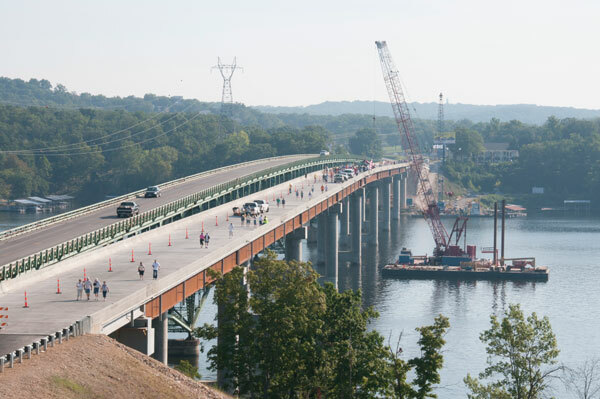 The Missouri Department of Transportation used design-bid-build with ATCs to replace the aging Hurricane Deck Bridge on Route 5 over the Lake of the Ozarks. One bid included an ATC to build the bridge on a new alignment. The ATC used less than half of the fabricated structural steel called for in the baseline design and eliminated a seven-day road closure. The contract award with ATCs was $32.3 million, 20 percent below the $40.4 million engineering estimate. The Michigan Department of Transportation piloted the ATC concept on a $22 million project to rehabilitate eight bridges and the roadway on a 7-mile stretch of U.S. 10. The ATC focus was on efficient, cost-effective alternatives for staging and maintaining traffic on the two-year project. Because the selected contractor’s proposal safely maintained traffic while accelerating construction, the agency projected the work would be finished nearly a year ahead of schedule. An ATC for the Hurricane Deck Bridge project in Missouri proposed building the bridge on a new alignment. FHWA’s Alternative Technical Concepts website includes links to state highway agency ATC websites. FHWA’s Alternative Contracting Methods Library features ATC resources. FHWA is offering a free webinar series on ATCs, including their use in the design-bid-build, design-build and construction manager/general contractor delivery methods; ATC development, submittal and review; and ATC legal issues. A Transportation Research Board publication, Alternative Technical Concepts for Contract Delivery Methods, documents how transportation agencies have successfully implemented ATCs during the highway contracting process. Two innovations highlight a $31 million upgrade and repair project at the twin-bore I-80 Carlin Tunnels in Nevada: installation of new light-emitting diode lighting systems and use of the construction-manager-at-risk project delivery method. The Nevada Department of Transportation received a Highways for LIFE grant from the Federal Highway Administration to support innovation use on the project. The 2-mile project section carries I-80 traffic through a local canyon and over the Humboldt River in Elko County. CMAR closely resembles the construction manager/general contractor project delivery method, an Every Day Counts innovation in which a contractor is hired to provide feedback during the design phase. By involving the construction manager early, the Nevada DOT saved one full construction season. Construction began in May 2013, said Dale Keller, Nevada DOT project manager. Repairs and a new LED lighting system have been completed on the eastbound lanes, and the westbound lanes will be finished this year. The project includes rehabilitating and seismically retrofitting eight bridges through Carlin Canyon, rehabilitating the roadway pavement and building a bicycle path. The new LED luminaires are specifically designed for tunnels. A sophisticated lighting control system employs dynamic dimming that responds to ambient light levels inside and outside the tunnels. The primary monitoring of outside ambient light levels will come from new luminous meter cameras that monitor the portal entries. The lighting system will dim the LED lights in the tunnel when outside light is dim and brighten them when ambient light is brighter. The goal is to minimize the transition for drivers’ eyes when vehicles enter the tunnel. an upgraded weather warning system. The equipment will be connected via fiber-optic network. The designers researched lighting technologies to evaluate the most cost-effective luminaires for the tunnels. They analyzed four main light sources: high-pressure sodium, metal halide, induction and LED. By a wide margin, the LED lighting systems were rated the most cost-effective. Their annual energy cost was estimated at $120,998, compared to $308,000 for an induction system. And the 20-year life-cycle cost for LED lights was about half that of induction lights, the next-closest system. The project is the Nevada DOT’s third and largest construction project using the CMAR delivery method. Although CMAR has been employed successfully in Nevada by local agencies, this delivery method is relatively new to the Nevada DOT. In 2011, the Nevada Legislature authorized use of CMAR on an experimental basis. The first contract called for repaving the detour road, building crossovers across I-80 and setting up the project. Early contractor involvement enabled the team to order LED luminaires and isolation bearings for the bridges—both long lead time items—so construction could start in 2013. If the traditional design-bid-build method had been used, construction would have been delayed until 2014 and the project would have taken three construction seasons instead of two. In a recent three-year period, this section of I-80 had about 70 crashes with 33 injuries and no fatalities. Most of the incidents were not collisions. The project team believes the upgraded lighting system will reduce traffic incidents, specifically non-collision crashes. More states—including Arkansas, Missouri and Pennsylvania—are coming up with plans to use the Federal Highway Administration’s incentive program for State Transportation Innovation Councils. Under the STIC Incentive Program, each STIC, made up of highway community stakeholders, can get up to $100,000 a year to defray the cost of making innovation standard practice. That incentive can be helpful in getting innovations deployed, said Jennifer Harper, research engineer for the Missouri Department of Transportation. Missouri is using STIC incentives to deploy high-friction surface treatments. For highway agencies trying to conserve resources, the cost of deploying an innovation the first time may not be in the project budget. “Providing an incentive to offset costs is sometimes the only way to get that initial deployment,” Harper said. After soliciting ideas from its members, the Missouri STIC chose two projects to pursue in 2014. In one, the Missouri DOT is partnering with Missouri University of Science and Technology to design a full-depth fiber-reinforced polymer bridge deck panel that’s stronger and more economical than those manufactured now. The Missouri STIC plans to use FHWA incentives to help fund the next research phase: developing connection details and specifications and working through constructability issues. 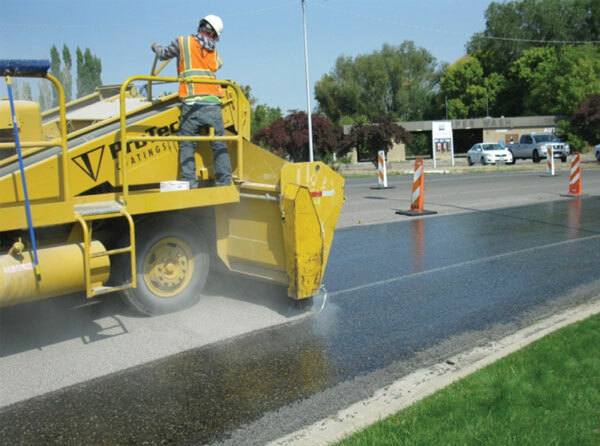 The Missouri STIC will also use funds to learn about the Kentucky Transportation Cabinet’s implementation of high-friction surface treatments, pavement technologies that can reduce crashes and fatalities. Missouri DOT and local agency staff will visit Kentucky for a peer exchange. 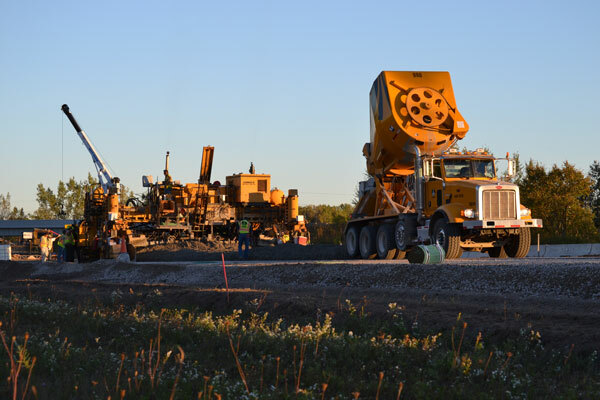 The Missouri team will focus on how Kentucky identified problem sites for installing high-friction surface treatments and best practices gleaned from using the technology. The Arkansas STIC also chose two projects for FHWA funding. One is a second round of traffic incident management responder training to accelerate the state’s deployment of a national multidisciplinary incident management process. Arkansas had its first train-the-trainer session for first responders in March. A second session will enable the state to train another 50 responders who, in turn, can teach other responders how to manage traffic incidents in a way that protects motorists and responders while minimizing the impact on traffic flow. Another project will help the Arkansas State Highway and Transportation Department use three-dimensional modeling in the project predesign phase. STIC funds will be used to customize software, buy hardware and hire experts to train agency staff and develop a procedures manual. The plan is to incorporate 3-D modeling early in the project development process, including during public outreach and preliminary planning, to enhance project design and improve construction and payment processes. The Pennsylvania STIC will use incentive funds for its initiative on rumble strip installation on thin pavement overlays, a new process. The money will go toward developing a compendium of best practices for installing milled rumble strips with pavement overlays. It’s a first step in changing Pennsylvania Department of Transportation policy and procedures for using the technologies together. The agency uses thin overlays as a standard option for pavement preservation projects because they can extend pavement life at a fraction of the cost of full-depth reclamation. It installs rumble strips—grooved patterns that give drivers an audible warning they’ve strayed from the driving lane—as a cost-effective way to lower highway fatalities. FHWA division offices in each state have information on applying for STIC incentives. 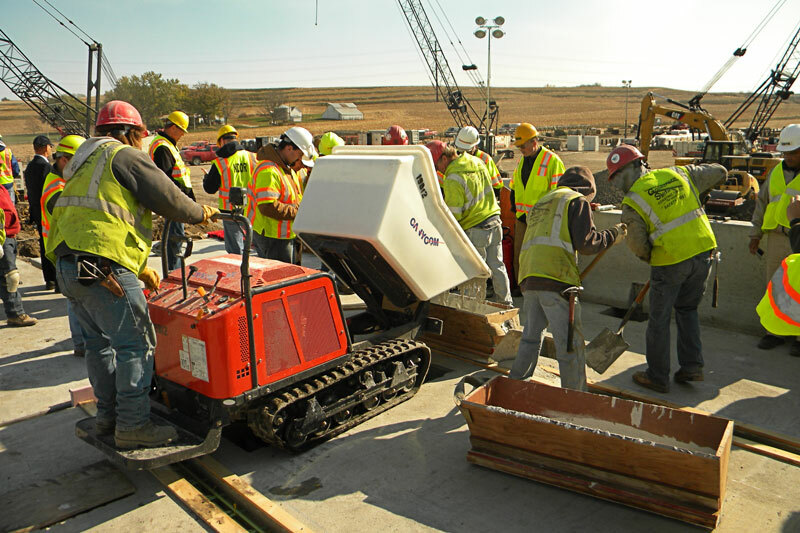 The cover of the U.S. Department of Transportation’s 2015 Budget Highlights shows workers replacing the Keg Creek Bridge in Iowa. Innovation helped the project succeed three ways: It used prefabricated superstructure and substructure elements, an Every Day Counts innovation. It received a Highways for LIFE grant to offset the cost of innovation. And it was a pilot project for the second Strategic Highway Research Program effort on innovative bridge designs for rapid renewal. 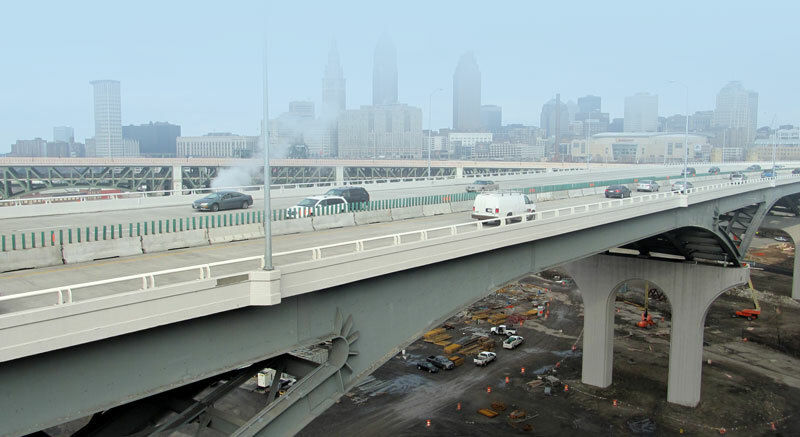 The Ohio Department of Transportation is using thermal integrity profiling to accelerate construction of the largest project in the agency’s history, replacing the aging Innerbelt Bridge in Cleveland with a pair of new structures. The new George V. Voinovich Bridge—one side opened in 2013 and the other beginning construction this year—is a vital link into downtown Cleveland, spanning the Cuyahoga River on I-90. A key connection between New York and Chicago, the bridge serves 140,000 motorists a day. Thermal integrity profiling is a nondestructive testing method that uses the heat generated by curing cement to evaluate the integrity of cast-in-place concrete foundations, such as drilled shafts or bored piles. It uses a tool known as a Thermal Integrity Profiler to measure concrete temperatures during the curing process by a probe inserted into access tubes or cables embedded in the concrete. Because test results can be evaluated just 24 to 48 hours after the concrete is poured, thermal integrity profiling can speed up a project’s construction schedule. Other testing methods are typically used after the concrete has cured, about three to seven days after casting. Thermal integrity profiling also evaluates the entire foundation element, something other methods can’t. Because thermal integrity profiling was used with other testing methods, it didn’t save any time during construction of the first structure. But the Ohio DOT required its use as part of the specifications for the sister span because if its potential to accelerate construction. On the first span, thermal integrity profiling evaluated the foundation integrity, shape and reinforcement cage alignment from temperatures measured in the drilled shafts during the concrete curing process. “Along with the potential for accelerated timelines, the technology also introduces the ability to evaluate the full cross section of the shaft, including the region outside of the reinforcing cage,” Clemings said. The Voinovich Bridge project is replacing the original 1959 structure with two nearly identical spans, one to carry traffic in each direction. They have a combined price tag of more than $500 million. Traffic will travel in both directions on the first span while work proceeds on the second project, in which workers will demolish the old bridge and build another one in its place. When the project is finished in 2016, each new span will carry five lanes of traffic, one more than the old bridge. 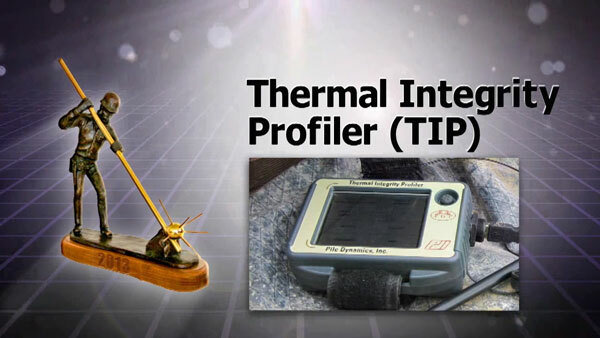 Thermal integrity profiling technology was developed by University of South Florida researchers. Foundation & Geotechnical Engineering of Plant City, Florida, and Pile Dynamics Inc. of Cleveland formed a joint venture to design the Thermal Integrity Profiler and take it to market. The engineers and researchers who developed the technology won a 2013 NOVA Award from the Construction Innovation Forum for their work. 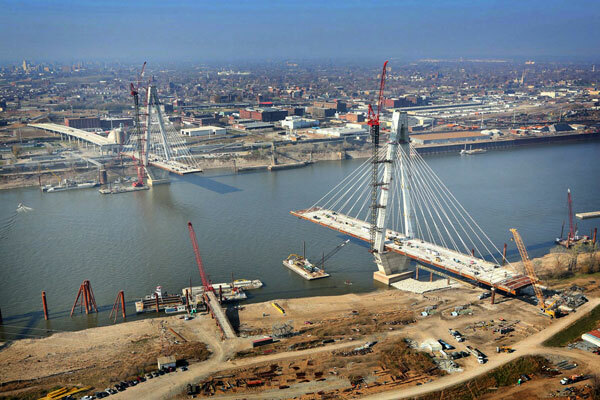 In addition to the Ohio bridge, thermal integrity profiling has been used on a number of projects across the country. More than 100 shafts were tested by this method on the Crosstown Connector project, a mile-long elevated section of highway in Tampa, Florida. It was also used on Governor Williams Highway over Black Creek in Darlington, South Carolina; an I-465 ramp over Big Eagle Creek in Indianapolis, Indiana; and the Milwaukee Zoo Interchange in Milwaukee, Wisconsin.